UC Santa Cruz will undertake an ambitious program to revamp its introductory courses in biology, chemistry, and physics, replacing lectures with a more active learning approach. Funded by a $1.5 million grant from the Howard Hughes Medical Institute (HHMI), the effort is intended to ensure that more of the students who enter UCSC planning to study science persist through the required courses to earn a science degree. Paul Koch, dean of physical and biological sciences at UCSC, will oversee the program and develop faculty teams to work on the different introductory course series. "This grant gives us the resources we need to make the transition to new ways of teaching introductory science courses. It's a big step forward for the campus," Koch said. "Our goal is to use a more active learning approach--instead of lecturing, we will have students learn by doing. These curricular innovations can have an impact in increasing the number of students who get degrees in science." In an approach known as "flipping the classroom," students will go online to access course material traditionally delivered in a lecture, while class time will be devoted to active learning through experiments, problem solving, and group projects. UC Santa Cruz was among 37 institutions to receive HHMI science education awards this year, out of 203 research universities invited to submit proposals (of which 170 submitted proposals). In announcing the awards, HHMI noted that most of the attrition from science majors occurs in the first two years of college, when students are taking introductory "gateway" courses. UC Santa Cruz is in a strong position to address the problem of student persistence in science and engineering, because the campus has an unusually good record of ensuring that its students earn degrees in the sciences. Nationally, only 40 percent of all undergraduates who begin college intending to major in science, technology, engineering, or mathematics (STEM) complete a STEM degree. The persistence rate is even worse, only 20 percent, for students from underrepresented racial and ethnic groups. At UCSC, however, the persistence rate is 57 percent overall and 51 percent for underrepresented minority students, well above the national average. "I see this grant as external verification that UCSC is a place that can have an impact on this pressing national problem," Koch said. The faculty who will lead the development of the new introductory courses at UCSC are all experienced teachers with a commitment to innovative teaching methods. Seasoned faculty from four departments will be involved: Molecular, Cell and Developmental Biology; Ecology and Evolutionary Biology; Chemistry and Biochemistry; and Physics. A new classroom will be needed that can accommodate as many as 125 students in an active learning environment, Koch said. Lecture halls with fixed seating won't work for classes in which students need to work together in groups and share their work with the rest of the class. The campus is exploring a location for the new classroom in the Science & Engineering Library. "Classrooms like this are being built all over the country. We have a small one in McHenry Library, but it's not large enough for a big introductory science class," Koch said. 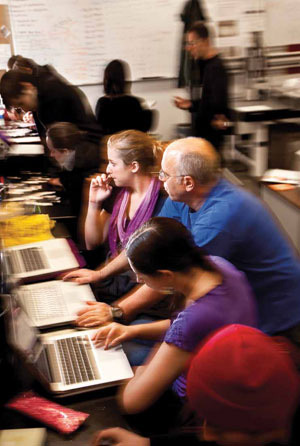 HHMI has supported other innovative science education programs at UCSC, including a Phage Genomics course for freshman biology students and an undergraduate research laboratory developed by Manuel Ares, professor of molecular, cell, and developmental biology, who received a $1 million grant as an HHMI professor in 2002. Compared to the earlier programs, the revamped introductory science courses will reach a much larger number of students, Koch said. The goal is to reach about 25 percent of the students taking these introductory science classes. The new courses will be launched over the next two years, with the first pilot courses planned for the 2015-16 academic year. The new grant complements recent gifts to UCSC in support of the Student Experience Initiative of the $300-million Campaign for UC Santa Cruz. A $2 million gift from the David and Lucile Packard Foundation supports field-based active learning programs in environmental studies, and a $1 million gift from alumna Julie Packard supports programs that help underrepresented minority students excel in the sciences and mathematics. "The HHMI grant supports active learning in the classroom, which is known to level the playing field for all students," Koch said. The Howard Hughes Medical Institute plays an influential role in advancing scientific research and education in the United States. For more than a quarter of a century, HHMI has provided grants to support undergraduate education at colleges and universities. These grants have focused on transforming science education in the United States by encouraging science teaching that is hands-on, research-oriented, and interdisciplinary.